A friendless emotional desperado who doesn’t realize he is being used as the boot boy of fascist hijackers and for other things. #OMEL, LOL it was hijacked long ago. 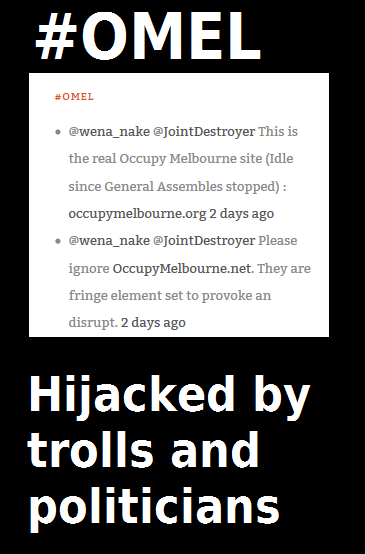 Following the interest in our feminism appreciation week, the hijackers that stole #OMEL along with all the other Occupy Melbourne media resources have claimed this website is not representative of Occupy Melbourne. 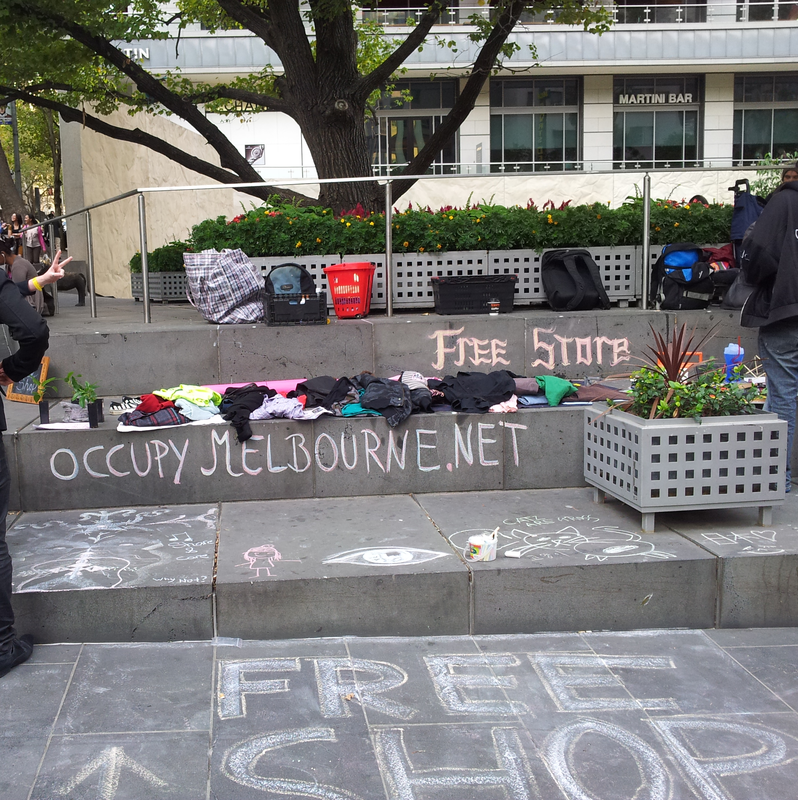 Occupy Melbourne was never truly unified, it was always a series of factions. Some people tried to claim they would act as representatives for the voices of the occupiers, but it didn’t take long before they saw themselves as elites who had special privileges and special rights. Most of the hijackers spend little or no time at the occupations. Many never slept over in the parks, but felt it was their right to dictate the terms and conditions of those who did. Eventually they claimed occupy Melbourne was dead but saw fit to continue to use all the media resources to promote their own agenda. 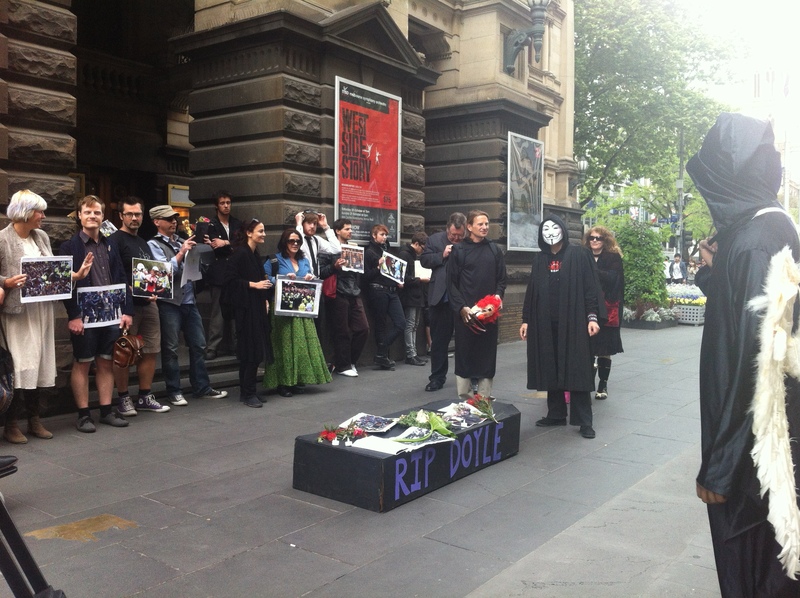 They didn’t care about Occupy Melbourne or its original stated causes or objectives. That’s why Nick Carson didn’t bother to monitor the OM Wikipedia page and let it get vandalized. They didn’t care that they didn’t renew the OM domain names, simply anyone could have taken this domain name. Nick Carson never wanted to say what happened to all the monetary donations, the email contact lists. 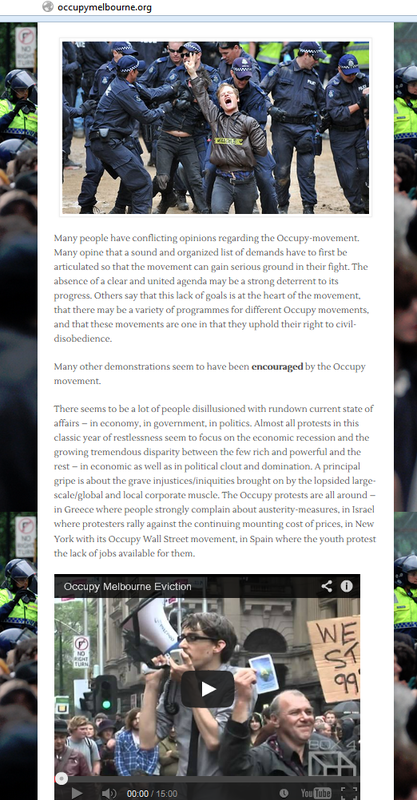 If the Nick Carson led faction of media hijackers hadn’t stolen the voice of occupy Melbourne, this website would never have needed to exist. 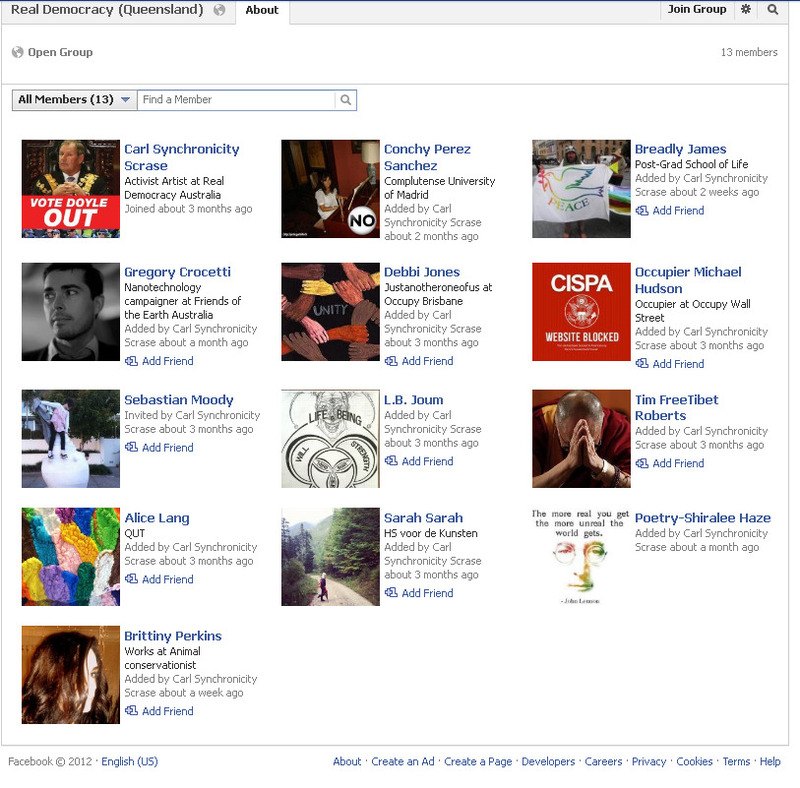 The fact that it does exist shows that he doesn’t represent Occupy Melbourne. People were so pissed off that their effort were being used to promote things they never voted for they started posting their own views here and asking for meaningful debate. Not every contributor here agrees with each other of different views, but most agree that the fraudulent monetary system we have is a cornerstone problem from which so many others originate from. Dozens of author invites were sent out, some actually wanted to respond and contribute. Many people are just addicted to Facebook, which is their own issue. The reality is Facebook is a tool of narcissism not activism, it’s totally superficial heavily monitored and achieves nothing. So when nick Carson and his hijacker faction say this is website is not authoritative, he’s not willing to admit, his media resources which he stole from the OM community are not authoritative. We even held a public meeting to declare the old media resources as dis-endorsed. This website was not funded by community donations has never asked for donations, doesn’t support any political party, Nick Carson cannot honestly make the same claims. 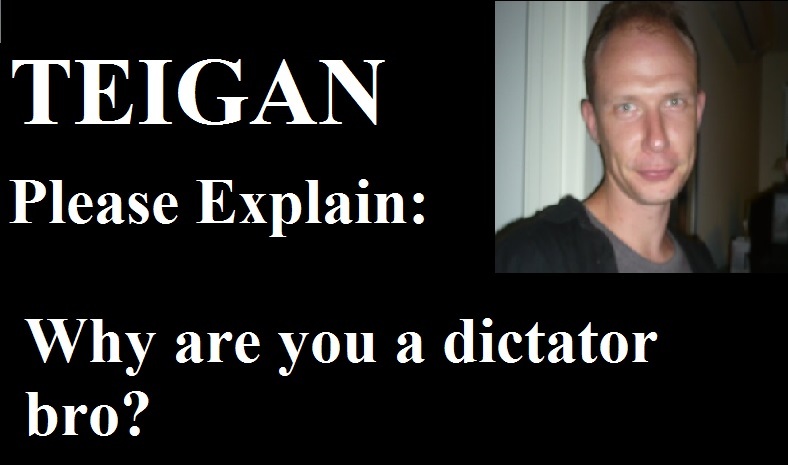 He’s a green party stooge posing as an activist, to push the green party agenda, which is Marxism. Because we are smart enough to realize Nick Carson and his hijacker faction for what they are; hijackers. Because we are smart enough to realize this and know how bad Marxism is we oppose it and all its branches. Every time we challenge him on his control of the stolen media resources he just spits out a series of lies like this: OM is dead, There is no media team, I don’t have the password, we haven’t had a GA about it, We don’t listen to the GA anymore, OWS doesn’t listen to the GA anymore…. You’ll see in the future he’ll use the OM platform to promote the green party and politics of the left in general, this will be done without mandate or a vote. Just be aware of his real agenda. This is the voice of the occupiers, is not going away, get used to it. It’s nice to know he’s occasionally reminded we exist and we are getting bigger all the time. Nick Carson has just arrived at the Free shop to try to claim credit for all the work everyone else has done. In the past he has claimed that he goes to the free shop but we believe this the first time he has actually shown up. So on the 6 month anniversary of the free shop Nick Carson wants to take over. So if you would like to ask Nick Carson why he hijacked all the media resources from Occupy Melbourne and to this day refused to give them back, go and ask him. He’s at the corner of Collins Street and Swanston Street, Melbourne 3000 Victoria, right now. Update: like a serial con man he is gone in a flash. And just to clarify for the future, Nick Carson is not an organizer for the march against Monsanto occurring next week, though it’s likely he will try to hijack that too. 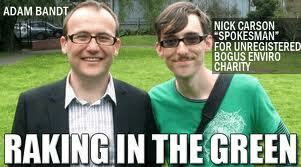 Nick Carson can’t say he never knew Adam Bandt. This could be the end of the freeshop. Demand answers from the hijackers if you want to save the free shop. 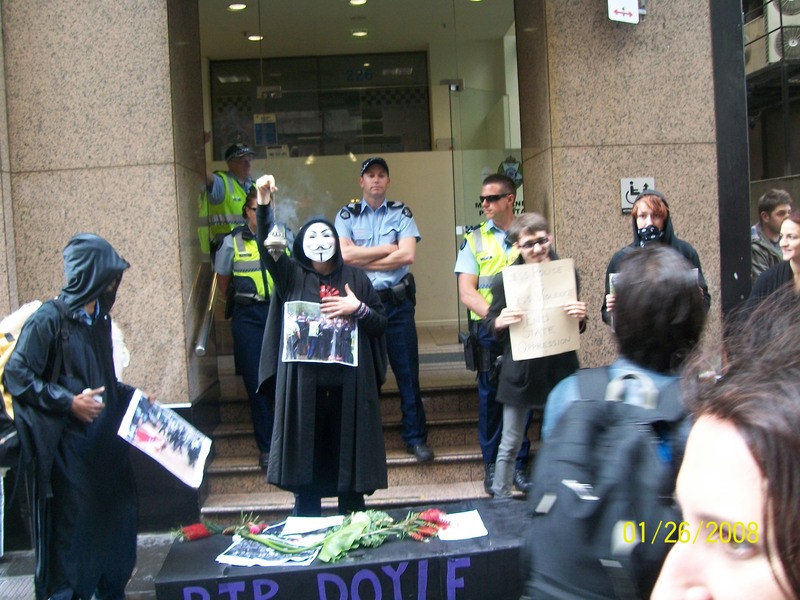 Occupy Melbourne Media Group – Sit back and let the hijackers slam it into the ground. After a year of hearing every excuse under the sun and moon from occupy Melbourne’s main facebook page managers why new content creators and administrators should not be added to keep the audience of 14,000+ people in touch with events on the ground in Melbourne, the managers namely scott day, teigan evans and nick carson said it’s theirs and its nobody elses business even though they hijacked it by removing the original page creators and admins claiming the original creators are with the loony fringe and don’t know what they are doing. I presented a case where participants of occupy in the past should be able to post to the audience with conditions that should be worked out by the community. We also had meetings in the city square to discuss options about opening it up for the different participants. 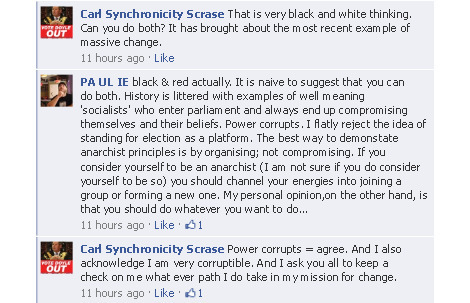 My personal opinion also shared by most others is that the following groups should be represented fairly on the page. There are definitely other groups not listed who have been shunned to provide a “single voice” as the current media group calls it. 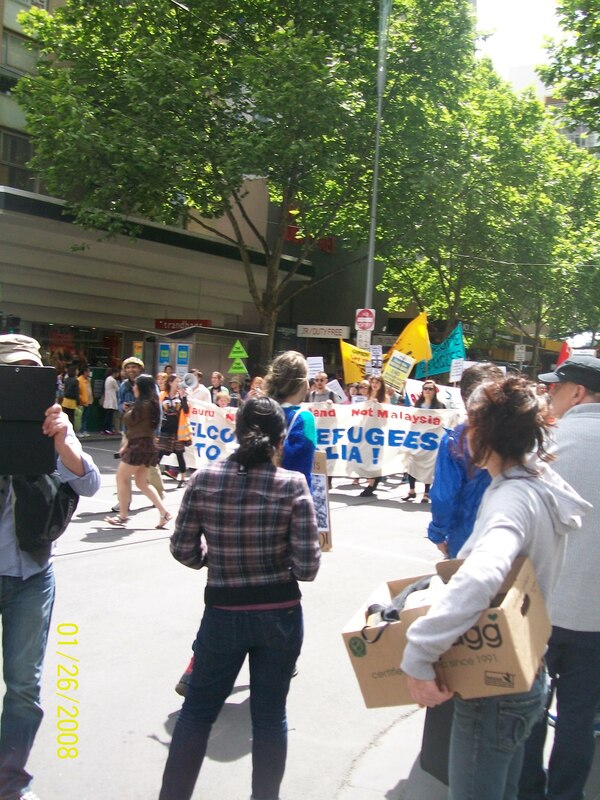 Also promoting other groups protests events in Melbourne. The response was “we don’t want the page getting trashed” even though all managers of the page have said occupy is dead and they are inactive on the page, they are happy for one of Melbournes biggest community protest pages to just die for some reason. Adding to all of this, the current media group decided to ban a content creator who was at the very first organising meeting for OM before it even started, his focus was on the international banking system and money itself. He was hounded down and discredited using main stream media lingo before getting banned. Such a sad state of affairs, please take note of all of this and make sure your protest movements in the future are not hijacked by people who want to try change the tune of the movement to suit their own personal agendas. 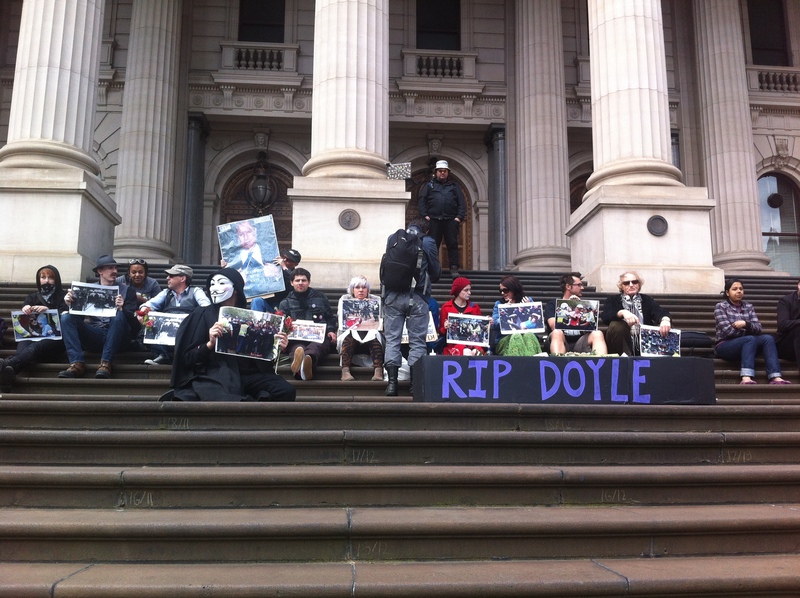 *note: None of the people asking for change wanted to be managers, we openly discussed and agreed the best option would be to get new managers within the 99% who have not been involved in negotiations, because there are plenty of people who went to occupy melbourne who are completely trustworthy to manage a page. Clearly we are not the only people who have noticed the isolationist dictatorial nature of the OM media team, that has a secret closed Facebook group ironically called ‘Iceland’. Being that Teigan Evans booted 5+ long stand OM members from the Iceland group, who had only been part of the Iceland group for a month (some had been in for only days), he could only expect to be seen as part of the Marxist ‘eastern bloc’ controlling the media team on Facebook. Strangely he didn’t have any reason for doing so, just apparently a big dummy spit. Really it’s just that Teigan along with he rest of the Iceland ‘eastern bloc’ bleat about democracy, but don’t believe in it. It just sounds good, aural opium for the unwashed masses. All hail the dear leaders. Because some animals are more equal than others. 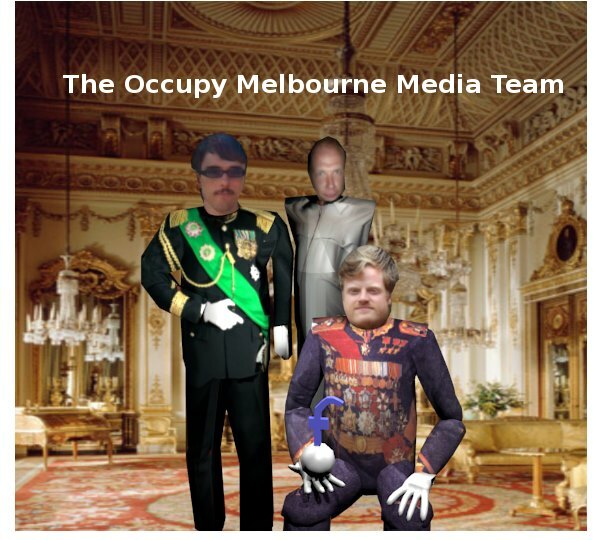 Today, we can celebrate the resignation of the former media team of Occupy Melbourne. Although there is a group of people that still clings to the public webspace of OM as gatekeeper for the 1%, those still interested in continuing the experiment of building a new society within the shell of old dying one have decided to keep the movement moving with a different swinging media team. How has it all begun? In 2011, the wind of change blew the seeds of the occupy tree around the world. When it started sprouting in Melbourne, it was detected by a control freak, ambitious for a political career. Let’s call this person Nick (similarities to real existing persons are purely intentional) for now. When Nick saw the sprouting happening, he called some friends to help transplanting this wilding growing movement into a tiny flower pot. He called this flower pot ‘media team’, and he and his friends swore to each other to tend this movement, to water it, let nobody close to it, and tell everyone what a beautiful fruit tree is growing in their tiny flower pot. After a short while, they stopped believing their own lies about the massive orchard quelling from their flower pot, and even stopped watering their catch at all. So they told everyone that couldn’t change the topic fast enough how dead OM is – they must know, their captured seedling withered away long ago. And while the media team managed to transplant some more wild seeds into their flower pot, it was certain that all that was occupy in Melbourne was dead and gone. Viciously they guarded the online corpse of ‘their’ movement, and trampled on anything grassroot like that still held the Occupy banner held up proudly. So let’s call them agents of Monsanto. That’s probably as wrong as calling them government spooks, still funnier and closer to the truth. The media mafia was more interested in success within the corrupt system than bringing it down. One of the incapable gardeners, let’s call him James, couldn’t wait to announce the death of OM, and now makes a buck from selling his obituary as lecture at the University Melbourne. Kudos to James to commercially exploit an ‘anti-capitalist’ movement. As the media team spend most time lamenting the death of the movement, and started a campaign of shameless self-promotion based in their decisive position within this movement, they blessed the occupiers continuing the ideas of the global movement with ignorance. The ‘official’ OM sites and facebook pages are currently maintained by a bunch of trolls. They have created a cyber zombie designed to wreak havoc among the activist community. However, the cold, icelandic polit bureau times are as good as gone. A movement that aims to change society and culture cannot be impeded by some self-obsessed, potentially sociopathic political amateur ideologues, at least not for long. 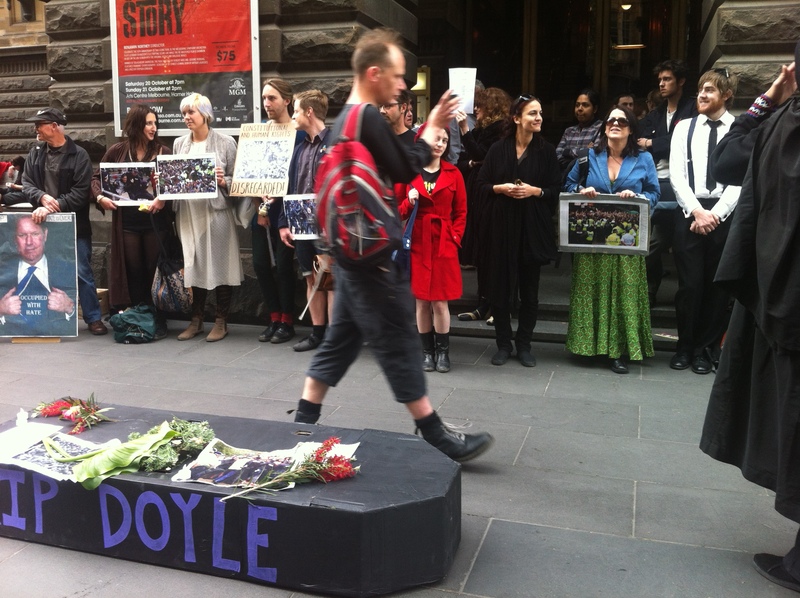 As Occupy Melbourne continued to win hearts and minds of the Melbournians, without any support of the media team (which hijacked the funeral procession of Rob Doyle’s career for more self-enlargement and media whore moments). 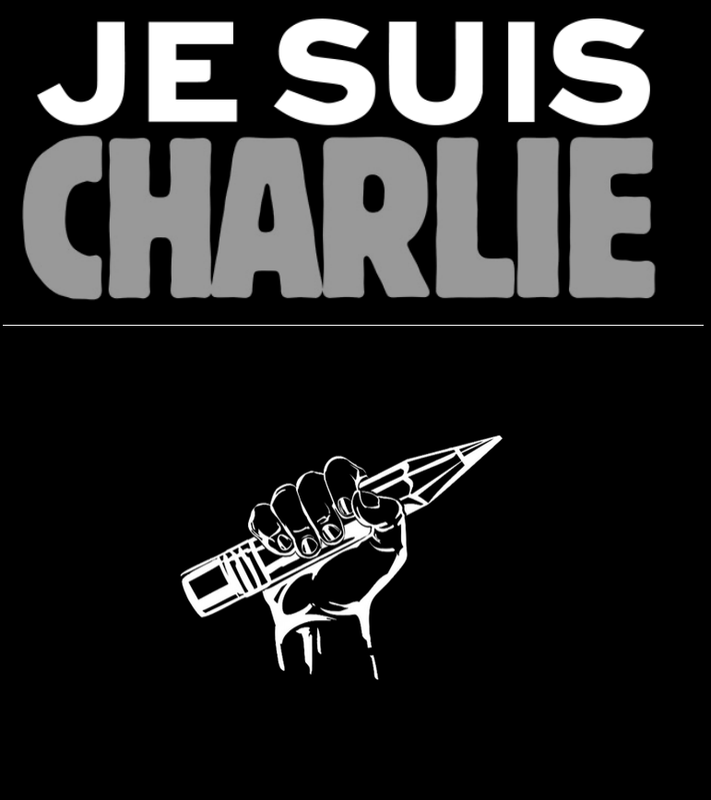 Without the polit bureau, the movement consolidated. Only time can tell whether the Icelandic heroes let go of their prey. However, if you want to study disinformation strategy follow the ‘official’ Occupy Melbourne fb page, still hijacked by the media team. Organic vs Synthetic! OccupyMelbourne vs Carson & Scrase inc.
On the surface it appears to be a collection of essays without any bias, or so it is promoted. Some are good and some give accounts, by people who never really camped or participated. However it may be easily assumed, as the subtlety of the title suggests, Reflects being a code word for something that has passed, suggesting its purpose is to bring to an end OM as a brand. The overall effect of the works gives a negative description of the movement and this is evidenced by the recent article in The Age News paper, whereby the anniversary of the Occupy Melbourne eviction received a very detrimental review, quoting information which it sourced from the Reflects journal. Even the OM legal team members have voiced their concerns about the paper, and leaves us wondering how this will help fair the court decision we are currently awaiting? It is important to note that many members refused to contribute to the Reflects journal, due to the way it was carried out, causing divisions led by a splinter group headed by Nick Carson and Carl Scrase, who are seeking to converge the members of OM into new personal organisations, one of which is entitled “Real Democracy Australia” The cause of division stems from the controlled take over of the web entity of OM, that has censored on ground members and silenced the majority. It is common knowledge that these individuals, along with a few, have tried to use OM for personal gains, building a political platform on which they may establish political careers. At a Reflects meeting Carl Scrase openly stated that he has a thirty year plan he wishes to pursue within Melbourne politics. Thus we find ourselves in the predicament, organic vs synthetic! Tactics employed by Carson and Scrase have been utilised in order to brand themselves as heads of OM. A controlled take over of the web entity and media lists has caused much censorship and manipulation, forcing original participants to leave, and locking many others out of the scene, yet all in the while shamelessly promoting their own agendas. Much is to be said about this, and shall be analysed and documented in near future. A simple example however is warranted here in order to illustrate types of tactics used. The main facebook and website of OM has not allowed sharing and or reporting of important works by on ground members. Currently this has been expanded to other outside connected groups, where they are spreading false reports of events, so that OM may be shut down, and converge into the synthetically formed groups that are headed by the aforementioned individuals. The common fashion is to cut and paste other peoples ideas and existing org templates, and brand it as their own. In a group named “citizen media collective” Carson has continued to systematically cut out members events, even though many of us are not only members of OM but are also members in CMC as well. The CMC co-ordinates participating citizen media to be present in varying capacities at community events and actions in Melbourne and Victoria to capture images, write articles, livetweet, livestream and other supportive methods of community story-telling. Yet this group is repeating not only the same censorship of Occupy Melbourne, that occurred in the main facebook page and websites, but in fact it is repeating the very same system of which we opposed and which is the very reason we as a people formed as a revolutionary movement, against state oppression. Carson has co-ordinated his friend photographer (former member who has left occupy) to censor the days events, and to purposely cut out the majority of members, who do not support his plans. The folowing is an example of the photos posted by Carson and Co, followed by a true photo of the days events. So we have to ask, Can you trust these individuals? How when even an offshoot page (which many of us are members, but are censored) cant report the simple truth, and favours personal agendas! They are politically inclined, for personal gains! This has been the source of division and discontent/mistrust within the OM movement. This has been the tactic on official OM pages, where they have blocked members, not mentioned events, and leaked to the media information that strengthens their causes, and leaves the damage to hard working occupiers etc. They are attempting to create fake movement groups in every state, via the Real Democracy Template, as seen in the following pic, and eg of Scrase manufacturing this RDA org by adding the same group of friends in every group, to give the false impression that these groups are organically springing up, but are not, and have failed thus far. He is now attempting to combine it in a simplified form as Real Democracy Melbourne! Not to mention that the cut and paste method has been scorned by original creators, and is also not supported by the majority of occupiers! notice above pic where all the people are added by Scrase, and no one participated! NOT ORGANIC!!! and while his party failed at gaining any support, check out the following video of another failed attempt, but interesting where he supports a biological virus injected into a placenta. 5. The refusal to engage in conversations with people who attempted to converse with them…. The cause of animosity, as people see them shamelessly promote their agendas, and pretend not to be aware of other events. 6. offshoot groups such as Citizen Media Collective claim to represent Melbourne activist events as they happen, and yet censor OM activities.